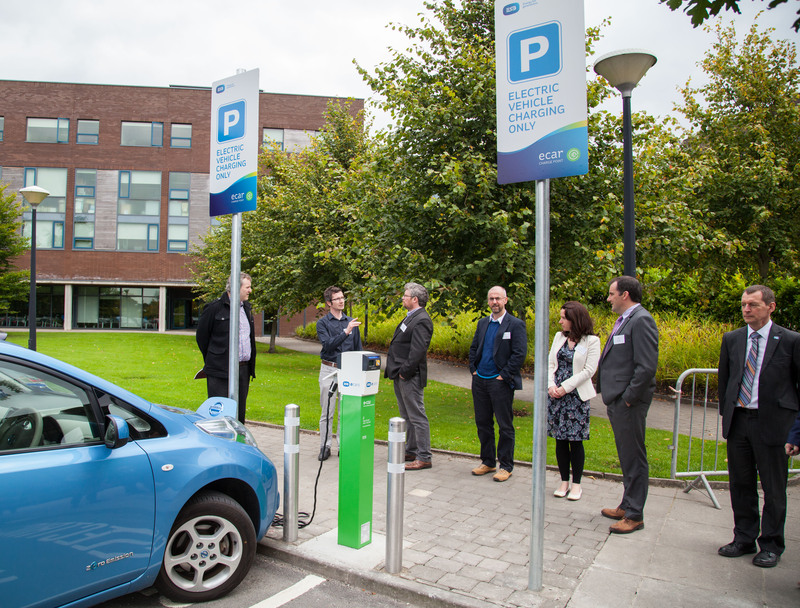 UL’s Green Campus Assessment takes place! UL’s Green Campus Committee hosted the Green Campus Assessment Panel yesterday, 9th September 2015. The assessment started with a tour of some of the sustainability features on campus and ended with presentations followed by questions and answers. 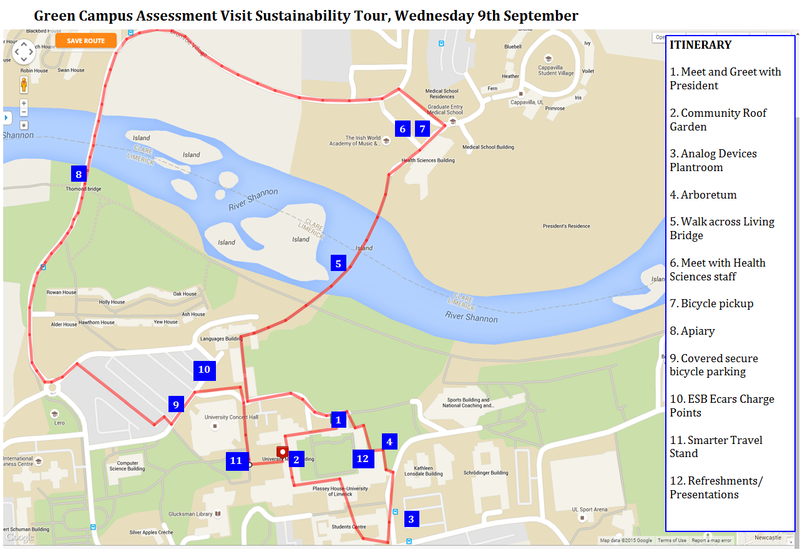 The assessment panel were brought on the tour shown below and met with many enthusiastic supporters of the Green Campus initiative along the way. UL President Prof Don Barry welcomes the Green Campus Assessment panel. 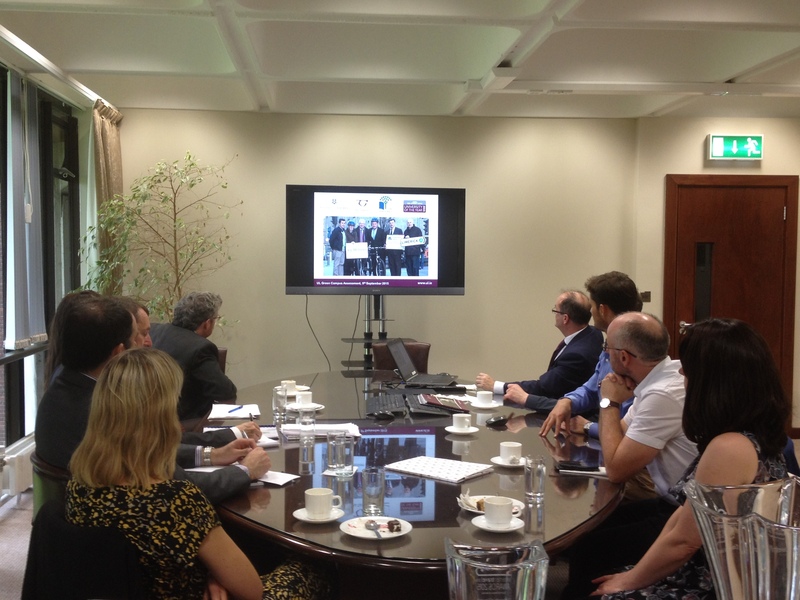 Dr Maria Lichrou, lecturer Kemmy Business School, UL briefs the assessment panel on the workings of UL’s Roof Garden. Dr Michael John O’Mahony and Jane Hackett (Green Campus Assessment Panel) take a closer look at some of the biodiversity on display at UL’s Roof Garden. Robert Reidy, Director Buildings and Estates UL (far left) outlines some of the energy efficiency features in the newly constructed Analog Devices Building. Dr Chris Fogarty (UL) and Dr Ian Humphreys (Green Campus Assessment Panel) discuss some of the energy features at UL’s Analog Devices Building. Robert Reidy, Dr Meabh Boylan (Green Campus Assessment Panel) and Deirdre O’Caroll (An Taisce) inspect some of the crop at UL’s orchard. Further inspection of UL’s orchard. Robert Reidy, Director Buildings and Estates UL, pointing out some trees of note in UL’s arboretum. 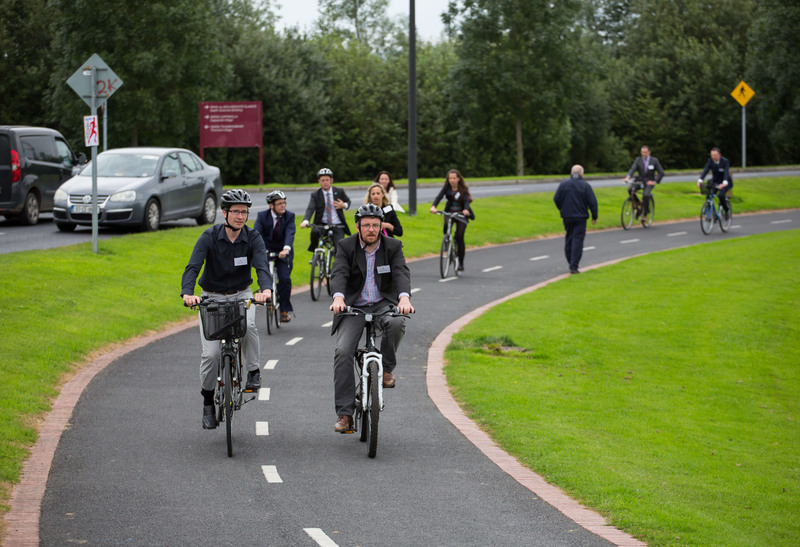 Sean M. Collins (Smarter Travel Deputy Coordinator UL) prepares Dr Ian Humphreys and Dr Michael John O’Mahony (Green Campus Assessment Panel) for their bike tour of the campus. The assessment panel enjoy a bike tour of UL. 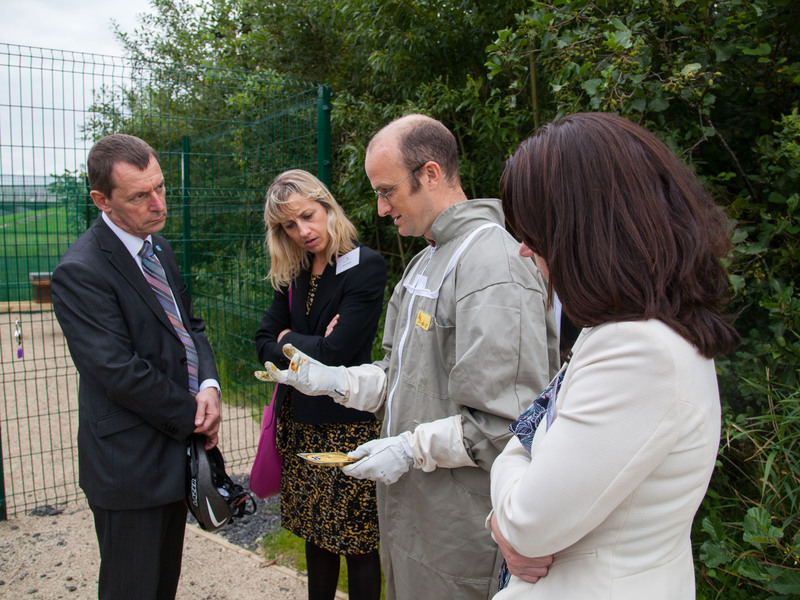 Dr Adam de Eyto (UL Apiary Coordinator) gives a fascinating insight into the development and maintenance of UL’s apiary. Trainee beekeepers at work in UL’s apiary. 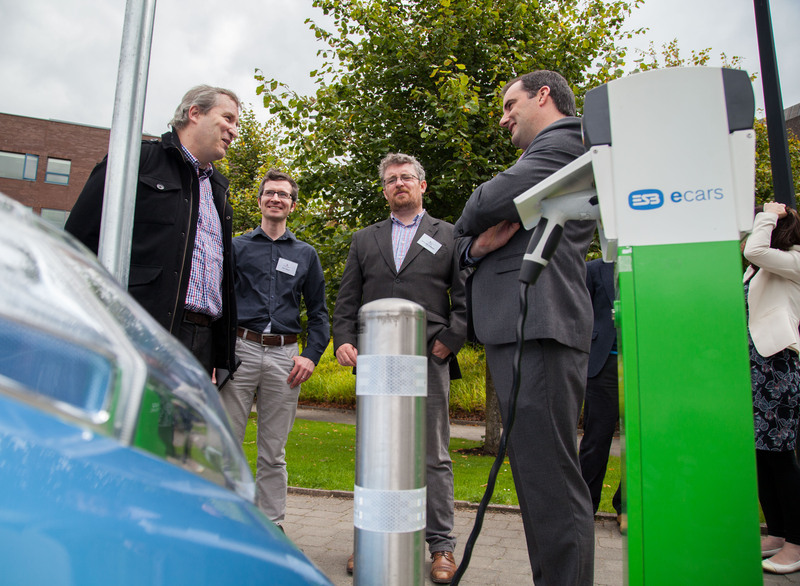 Dr Chris Fogarty and Dr Tom Conway explain how UL’s Electric Vehicle Chargepoints came about. Ross Higgins, Smarter Travel Coordinator and Green Campus Committee member hosts a visit of the Green Campus Assessment Panel to the Smarter Travel stand and later addresses the assessment panel as part of the presentations and Questions and Answers session. We’re hoping for a positive outcome! This entry was posted in Uncategorized and tagged Biodiversity, Energy, Travel & Transport. Bookmark the permalink.